Locking magnetic jewelry clasps make necklaces and bracelets simple to attach—locking safely in place. Just fasten to jewelry for quick, easy on/off; interlocking ridges keep magnets securely clasped. Lobster claws. Set of 4. 70% alloy/25% iron/5% magnet. I am recovering from a stroke and cannot raise my left arm high enough to clasp necklaces and chains around my neck. These magnetic clasps are awesome and allow me to wear my favorite necklaces with no struggles! The product is easy to use and it lengthens my necklaces. They are easy to install and easy to use. Good quality magnet and for arthritis fingers easy to use. Having lost a significant amount of strength in both hands from carpel tunnel and several hand surgeries, I have difficulty with small necklace clasps. These make wearing my necklaces so much easier. I highly recommend them! 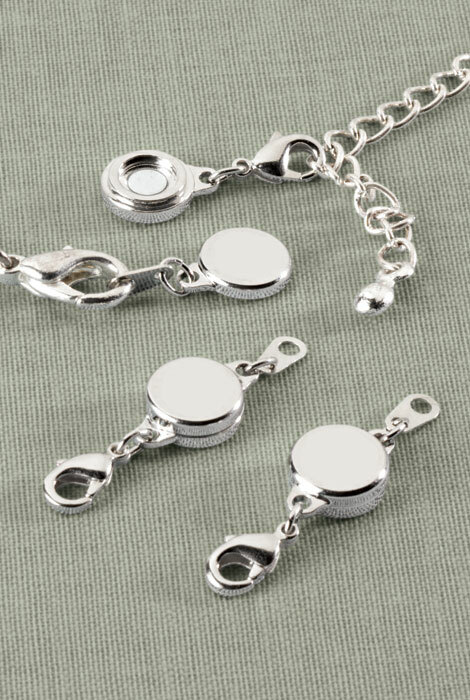 These magnetic clasps are very helpful when quickly putting on necklaces. I can't live without them. I purchased them in both silvertone and goldstone. Very easy to attach to chain clasp. Magnetic Necklace clasps save aggravation! I love these magnetic necklace clasps! They save considerable aggravation in getting necklace clasps to work! I use as a closing on my necklace and bracelets. It makes it much easier for me to close. I have not had any problems with them at this point. Fastening necklaces was getting more and more frustrating. I've tried the screw-in type of clasps but they weren't easier than the original clasps. These magnetic clasps have strong magnets and fasten so easily. I gave my wife a very nice necklace, unfortunately at our age (both are 71) neither of us could work thr tiny "lobster" clasp. I bought your magnetic clasps and now she can wear the necklace ANYTIME! She love the necklace, clasp and me! Thank you very much. Very nice locking magnetic clasp the best that I have found so far. Took me a time or two to figure out how it worked but once I got the hang of it, I was very happy with the product. These are the answer to the problem of tiny jewelry clasps! These magnetic clasps have solved my problem of getting the clasps closed on my best necklaces, which have very fine, tiny clasps. I will be ordering more of these! I have trouble getting necklaces on and these are great! Once price. I hope the hold up over time. Makes my favorite pendants easier to fasten and enjoy. These make putting on jewelry so easy and fast. I love them! Great invention. Can't live without them now. Love these . Easy to use because of my arthritis. Can only use foe necklaces . They add too much length for bracelets. I have arthritis, so this halp. This magnetic clasp is fabulous. I bought both the gold tone and silver tone have attached to four pieces of jewelry. Easy to do. Separating the magnet in the clasp can be a wee bit difficult, but it's OK. They need to be strong magnets to keep the jewelry on. That small inconvenience is well worth the peace of mind to know you will not loose your necklace. Love them! They help greatly fastening necklaces which I can no longer fasten by myself. All the women in my family want these! These magnetic clasps are very useful and helpful.I have put them on most of my necklaces. As soon as my women friends and family saw how helpful they were, they all wanted them. I have ordered them for my daughters. I like that they are available in gold and silver. These are great for those of us whose hands and fingers don't work as well as they once did. It's great to be able to put necklaces on without needing help from my husband. Everything is great about these magnetic clasps. So very easy to use and they snap on for security. USED ON TENNIS BRACELET - GREAT PRODUCT - MAGNETS HOLD VERY WELL. They are great to replace the clasps on necklaces and bracelets for children's jewelry as well as for older folks like me, it makes wearing jewerlry a lot easier. Locks nicely, easy to use for arthritic hands. Holds chain securely. So nice to use these on necklaces that have not been able to wear because could not handle the clasps. What a great invention for people having trouble with clasps. These are wonderful. Going to get more so can put on more necklaces rather than move them from one to another. Strong enough to wear with your most precious jewelry. I've always had trouble with small clasps. I even put this on my diamond necklace. I love these! Correcctly stated in the catalog. They are easy to attach. They look great and never come apart. I have lost some jewelry that did not have a strong enough bind. These are great and I intend to continue their use even though the finish both silver and gold tends to tarnish after multiple uses in a year or so.I will just order more replacements because they are so easy to take on and off. Can be used with any kind of chain and comes in both silver and gold. They are less bulky and heavy than other types of magnets I have tried; therefore, they stay in place better. They seem durable, but I haven't had them long enough to attest to that. They do require more dexterity than some others so they take more time to fasten and unfasten. It would be nice to be able to get them in sterling and in gold coating for your more expensive necklaces. I like this product and it has been handy to use with some of my necklaces. These are not extenders but just a clasp at the end of the necklace. Sometimes it is a little tricky to separate them but a lot easier than the regular clasp on most necklaces. I thought the price was good for four of them. I will buy another set in the future so I will have enough for my necklaces and not have to transfer them from one to another. I even recommended it to my Occupational Therapist for her other clients. I'd like to get enough of these for all my pendants. Saves a lot of time fooling around with clasps. Wasn't wearing my necklace's because I had trouble fasting them. Have some arthirius in my hands & fingers. Now I can enjoy wearing them. This has made it so easy to put on accessories without having to ask for help. It is great when there is no one around. Great little accessory. Makes putting your necklaces on, a breeze. One setback, the little magnets can fall out , then it's useless. Only happened once. These clasps are quite small and I couldn't get them open at first but once I got them open, they were great. The magnets are very strong so you don't even have to worry about locking them. I bought this to fit a necklace with a crucifix that I wear daily. I shower in it and rarely take it off. It was easy to connect it to my necklace. My only complaint is that it weighs slightly more than the necklace so I am constantly having to make certain that the cross is visible at my neck and not the clasp. I am using this magnet closure for something other than it was intended. In my crafts and sewing. These magnetic clasps work great especially if you have a tiny clasp on your necklace that is hard to fasten. I haven't had a problem with them coming undone at all. Also, the company was very prompt in shipping them out,which is a great quality. I attached two gold chains to the gold-toned magnetic clasp. They do not tangle now! The magnets are very powerful and they are easy to use. I love the idea--and I will put up with the tarnish at the price I paid. They'd be perfect if they didn't turn colors. Love the quality. Needs to attach differently for some types of necklaces. Very easy for putting jewelry on by yourself. The clasp is too heavy. The magnet works fine but when I used it with a fine chain and pendant the clasp kept coming to the front of my body. I've owned these before to assist with ease of wearing my clasp necklaces. With nails and/or arthritis, it's difficult and time consuming without a magnetic clasp. I ordered these for myself & an elderly relative. I understand the concept as I own other brands, but I can't get these to work. They are so delicate, it's hard to connect the clasp to the necklace. It's a shame because they are still needed. Hopefully, someone can assist me in connecting them to the original necklace. If not, it was a total waste of money. The idea is great, but the engineering was deficient. These magnets were not strong enough to do the job. Very disappointing. Sent them all back. I needed this item for use on a bracelet that had a difficult clasp. The very first time I used the magnet, the bracelet fell off my wrist. I didn't notice when this happened. Fortunately, my waitress accidentally stepped on my bracelet and then returned it to me. These magnets are not strong enough and I will not use them again. Comes apart easily. Would not use on valuables. There are others sold that are more secure. Wish I got those. These were for gifts and I ordered several sets. These should not be sold as locking magnets. They will not hold the lightest necklace. Hard for me to put on bracelets. I like this item very much, because it makes using your jewelry easy and the locking feature keeps your jewelry secure. My mother had a stroke. My dad likes to put jewelry on her and it is easier to use a magnetic clasp than the clasp on the necklace itself. Wanted a clasp that was more streamline and lighter weight than others. To make it easier on myself. I cannot see well enough for regular clasps. these look small enough so the necklace wont turn. I have bought several of these in the past. As my husband keeps buying more necklaces, I need to buy more. They are strong and have had no problem with them coming apart, in fact the first couple times I tried to open them, it was a "tug of war" as they are built to hold. Appeared it would work for my 94 year old mother who cannot work regular clasps on her necklaces. Hoping the magnets are strong enough. I have these magnetic Jewelry Clasps in silver tone, very easy to use. I need to add gold tone to go with my gold necklaces. These are great, easy to use. I recommend these clasps for anyone with arthritic thumbs. I chose this to put on my mother's pearls so that she can wear them when I am not here to fasten them for her! I wanted something I could trust. I have necklaces that are hard for me to put on because of my nails being in the way. Hoping this will help. I'e struggled for years with arthritic thumbs and false nails - not a good combination for fastening necklaces. Hopefully these clasps will be the answer.. These are great helpers for my arthritic hands. The reviews were good and it was what I was needing. Looks small though no dimensions are given. Needs to be light weight for a fine chain. I need to add to the length of a bracelet. Having trouble doing the clasps, hope this helps. I have difficulty managing small jewelry clasps. I am hoping this product will solve the problem. Many necklaces I have need this I really hope it works! I can't use clasps any more with aging eyesight. WORKS GREAT! My mom can use them with ease. Is this product useful with a braclet? BEST ANSWER: Absolutely! I have difficulty putting on a bracelet or necklace. All you do is connect the magnetic locks to the existing ends of the necklace or bracelet. They stick tight but easily come apart when you are ready to remove your jewelry. Yes, it is very useful, but I almost lost one of my favorite bracelets using it. It came apart and I didn't notice it at the time. I did find my bracelet, but will not use it again till I have a chain on it first. Its very helpful. I wear glasses and it makes putting jewelry on easy ...so now I wear my necklaces more often; which I love. Very useful. Magnets only need to be close to each other to engage. No need to open clasps and insert tiny rings. Yes. Have used on bracelet did not wear often, and it worked wonderful. BUT I love them on all my necklaces. Do they come in both gold and silver? Thank you for your question.Yes, this item is offered in both goldtone and silvertone. We hope this information will be of help to you. yes they do come in either gold or silver. It says four. Is this four sets or four pieces making two sets? BEST ANSWER: It is 4 sets or 8 pieces. These are wonderful and have made me able to wear my diamond necklaces again. I have all numb fingers and cannot open the clasps anymore. I have now purchased 2 sets for all my necklaces and had my granddaughter put them on and I do not have to interchange. You cannot separate the magnets by tugging on necklace, so they will not open when you don't want them to. It's a set of four, but I found that the links are too small to attach to some of my jewelry. They are good for smaller links, especially bracelets. There are 4 magnetic clasps altogether, I was pleased with the order. I'm planning to use these for a charm bracelet that is heavy. Are these magnets strong enough to hold a heavier piece of jewelry? BEST ANSWER: I don't think this magnet is a good idea for a charm bracelet of much weight. Also, such bracelets are prone to getting caught on clothing or furniture, and the magnet can pretty easily be pulled apart. I use the magnet only on fairly light-weight pendant necklaces. You could add a safety chain just in case the magnet comes apart. BEST ANSWER: Thank you for your question. The clasp is 1 ¼” long and the diameter of the magnet is 3/8”.We hope this information will be of help to you.